Halfway up a mountain in the Canadian Rockies exists a very unique place, a true natural wonder; the Booming Ice Chasm. 5 pitches of fun, anxiety, and excitement. This day was truly an incredible adventure that we will not forget soon. 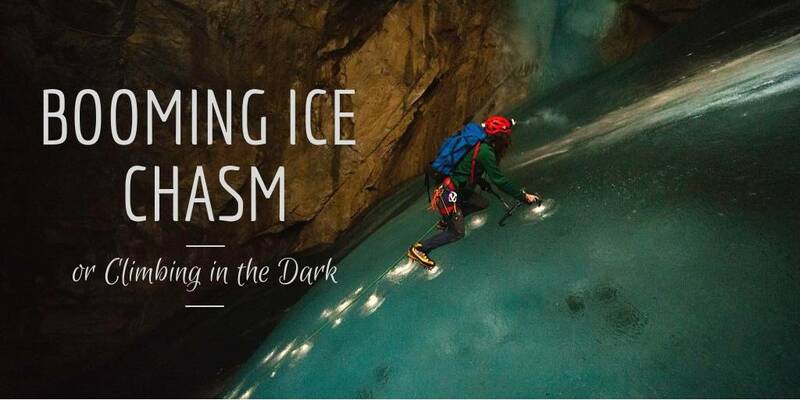 The Booming Ice Chasm cave contains a 180m long sheet of clear ice that never melts. It is protected from the heat of summer by a year-round pocket of freezing air. 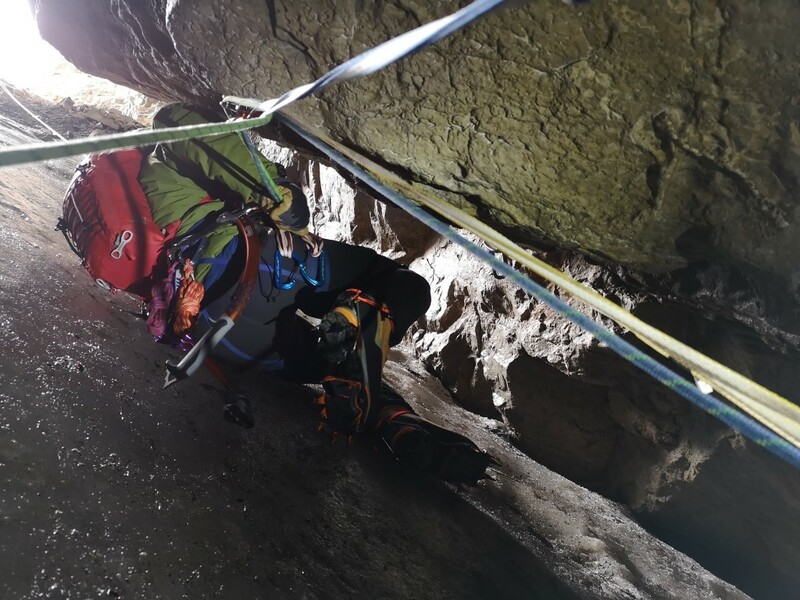 Since its discovery in 2008, the cave has received coverage from multiple high-profile media outlets, as well as an entire episode of the 16x9 news program. But somehow, this icy wonder sees few visitors, which might be for the best. Everyone who has been there has kept the details to a minimum, which is a pattern I will follow. 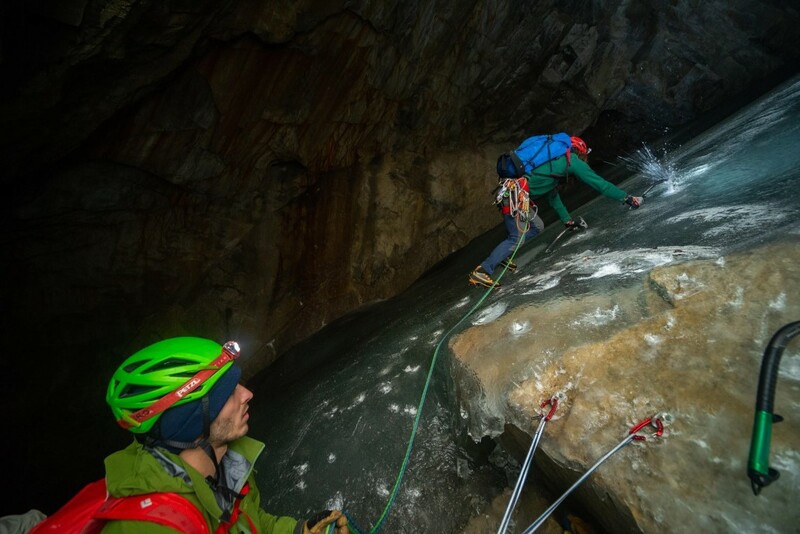 Length: 180m, 3-5 pitches of low angle ice. Quickdraws - we had 8 DMM Alpha Trad quickdraws and 2 Black Diamond Oz Runner Set extendable quickdraws. Ice tools - I brought my Black Diamond Cobra Ice Tools, the cobra is my tool of choice for anything from alpine climbing to steep waterfall ice. Footwear - I wore my La Sportiva Trango Ice Cube GTX mountaineering boots paired with the Petzl Lynx crampons for the climb, and I brought a pair of trail runners for the approach. Helmet - I wore my Black Diamond Vapor, it's light enough that sometimes I even forget I'm wearing it. Backpack - I chose to bring the Black Diamond Mission 35, excellent support and a climbing specific feature set make this one of the most used bags in my quiver. 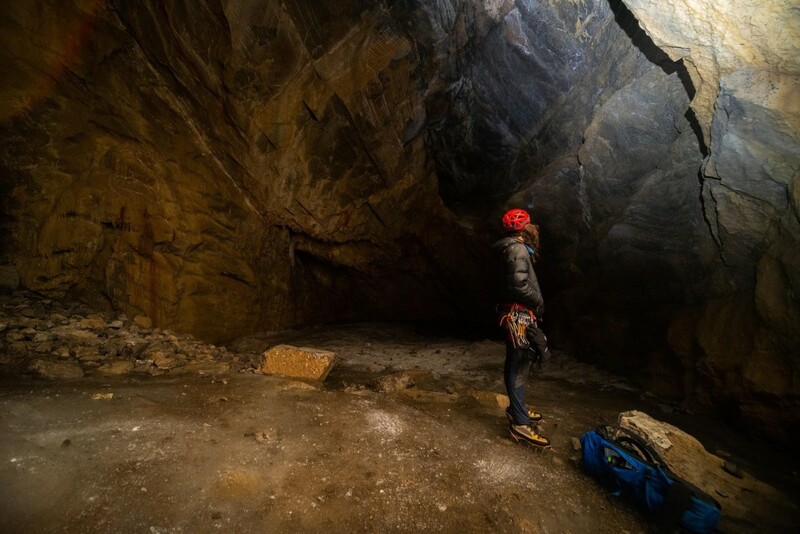 Clothing - I wore a standard ice climbing setup in the cave and some lighter layers on the approach. Somethings never get less impressive the more you see them; the mouth of the booming ice chasm is definitely one of them. This being my second trip to the cave, I was expecting to be less intimidated by the cave. However, as I peered down the massive funnel I was just as anxious as the first time I laid eyes on it. This time, I had fellow Vertical Addiction employees Branden and Aidan with me. After having taken some pictures and taking in the views, we started to put on our climbing layers and boots. 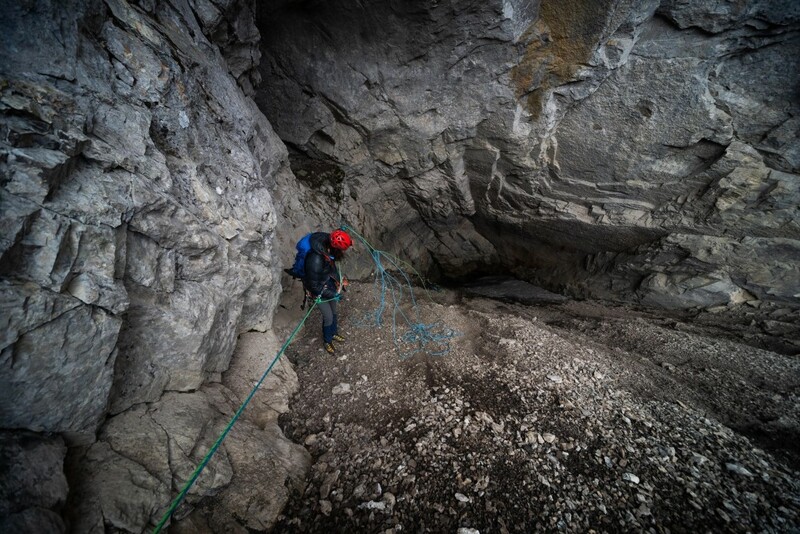 Once we had our gear on, we threaded the ropes through the first anchor and tossed the ropes down the scree toward the caves entrance. This first rappel goes down low angle scree and snow that funnels down to the narrow entrance to the cave, about halfway down you hit the wall of cold air that preserves the ice. 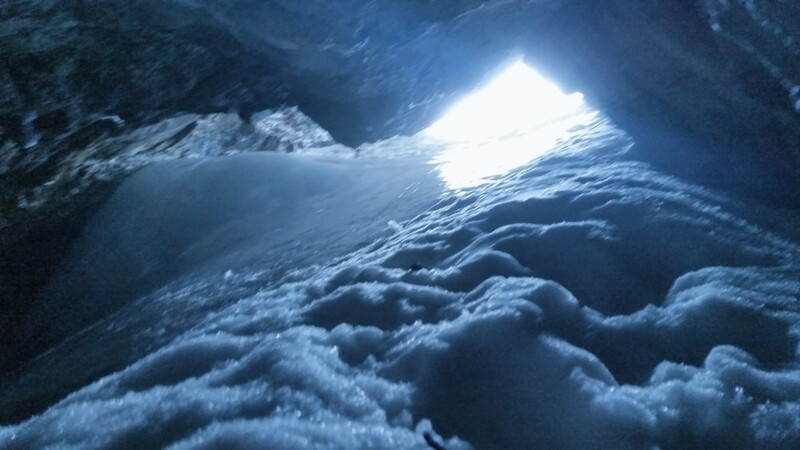 Once in the mouth, there is a two-bolt anchor on the roof of the cave, which is about 4 feet above the ice. This anchor is very awkward to stand at, and it's scary because the next person coming down must be very careful not to dislodge any scree as the anchor is right in the line of fire. Below the anchor, the ice steepens and drops away into the abyss, the blackness eats the beams of our headlamps and any sound loudly echoes. After we all arrived at the anchor, we pulled the ropes and tossed them into the darkness below. The next rappel goes down the steeper ice for 15 meters before backing off to a lower angle, I went down a total of 55 meters to a flat top, atop a bulge feature, where I built a v-thread. Once my eyes adjusted, I found myself in the most amazing place in the world. A massive chamber - 30 meters wide and 20 meters high -with beautiful streaked limestone walls. On the far side, there is a 20 meter frozen flow and an incredible chandeliered piece of ice that is almost the height of the cave. Another rappel down low angle ice brought us to a bolted anchor among several large boulders, frozen in the ice. 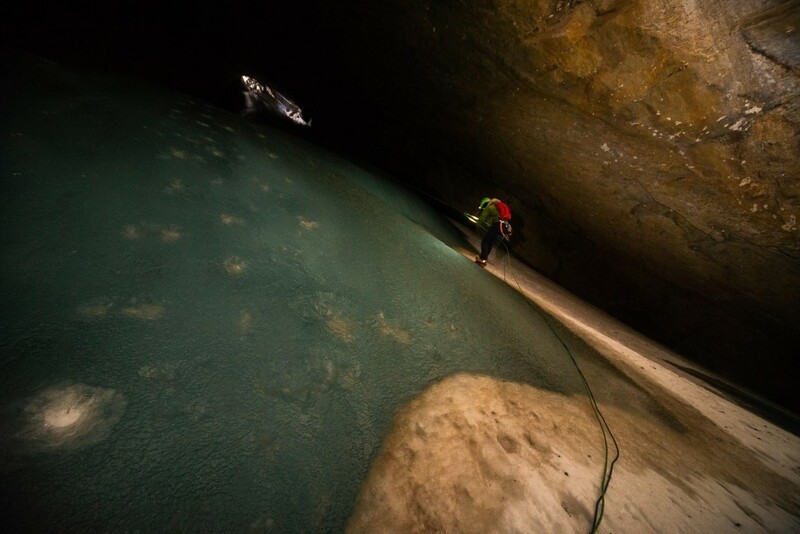 One more rappel brought us to the bottom of the cave: a large chamber with a frozen lake. After a quick break at the bottom, we decided to start the climb back out. The first pitch was easy low angle ice. Branden started motoring snow and scree towards the ice on the right side. Once on the ice, he climbed up near the right wall. The ice starts off as a bit thin but quickly becomes fat clear ice. Following this pitch was a great way to warm up the calves for the pitches above. 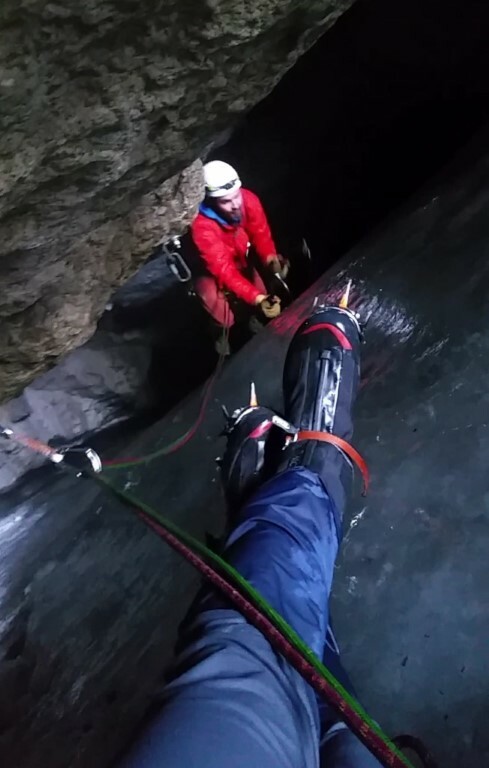 At the belay station, I took the lead and peeled left and up the low angle ice, periodically using the calf resting techniques I had learned on my last trip into the cave. The ice is perfectly flat and has no features to rest on, so efficiency is key for not having fiery calves. I ended this pitch at the base of the steeper bulge feature, about 45 meters from the last belay. We wanted to take some photos of me climbing the bulge, so we needed to get Branden and all his gear to the top of the bulge ahead of us, he opted to go around it on the right side, on a calf friendly snowfield, as to not disturb the pristine ice. The snow offered fast easy travel to the top of the bulge, but the protection options were limited. Once Branden was in position, I cut left and took the steepest part of the bulge head on. The ice wasn’t too steep, but it was definitely steeper than the other pitches. It was nice because for a few body lengths I could rely a little more on traditional ice climbing techniques to rest my calves due to the increased angle. The ice was transparent, and it felt like I was flying. Unfortunately, the angle started to back off and before I knew it I was on top of the bulge. This next pitch was pure calf doom, the memories of searing calf burn was still fresh in my memory from when I was last in the cave. Thankfully, Branden stepped up, so I didn’t have to lead it again. Branden battled up the sustained ramp of hard clear ice, resting his calves whenever he could, but the burn didn’t stop him from getting to the top of the steep section and getting in a belay 20m from the exit. I was left with a short pitch to the top. After a section of ice, I got to a snow rest where I dumped my pack, so I could wriggle my way through the final squeeze to freedom unencumbered. I set a belay when I got some headroom and brought the boys up. They grabbed my pack on the way past and climbed up onto the snowfield above. From there, we scrambled up to the ledge into a blowing snowstorm! We quickly transitioned back to hiking and started to race down the trail again, all of us still processing the experience we had just had. All the fun, anxiety, and excitement that place had brought us was truly an incredible adventure that we would not forget soon. 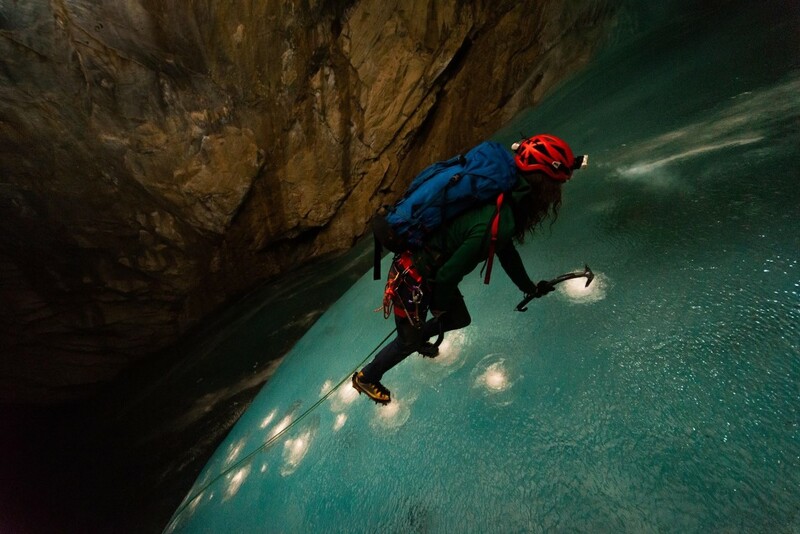 This isn't your everyday waterfall ice climb, this is caving! 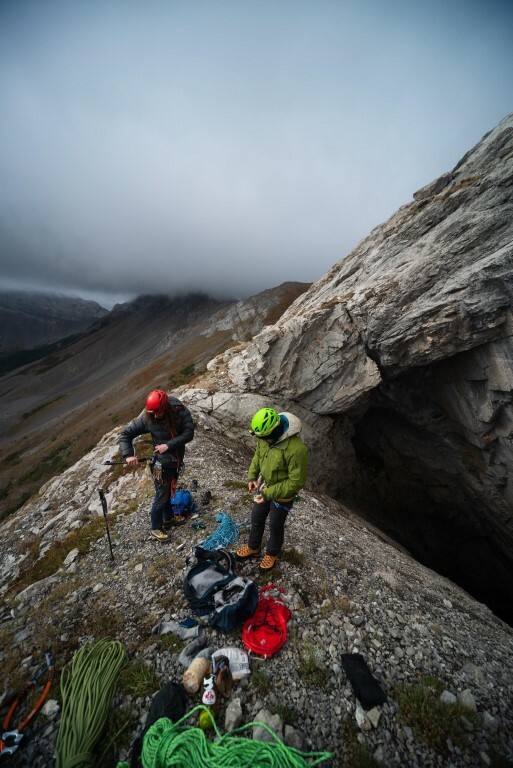 Before heading into the cave be sure to hone your underground skills in a less technical cave. It would be quite unwise to go into this cave with no experience underground. 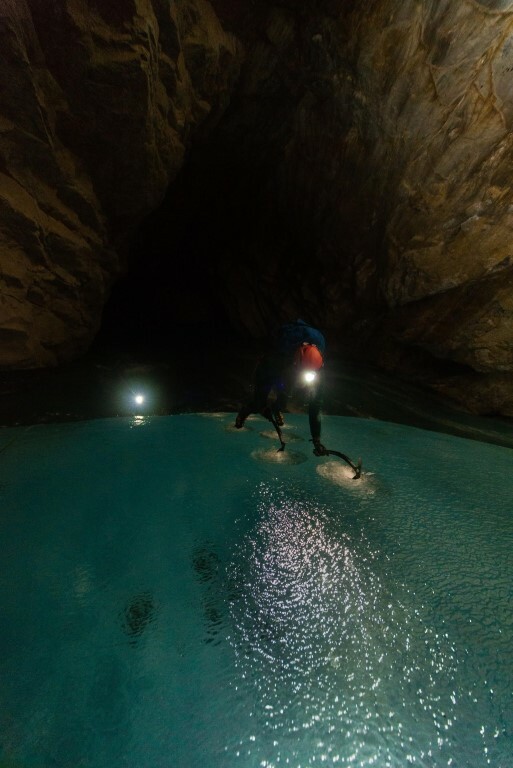 Mark your anchors with Glowsticks as you descend into the cave. It will make finding the belays much easier in the dark. If you hike up and find that another party is already in the cave, DO NOT enter the cave. Either wait until they exit the cave or simply turn around. 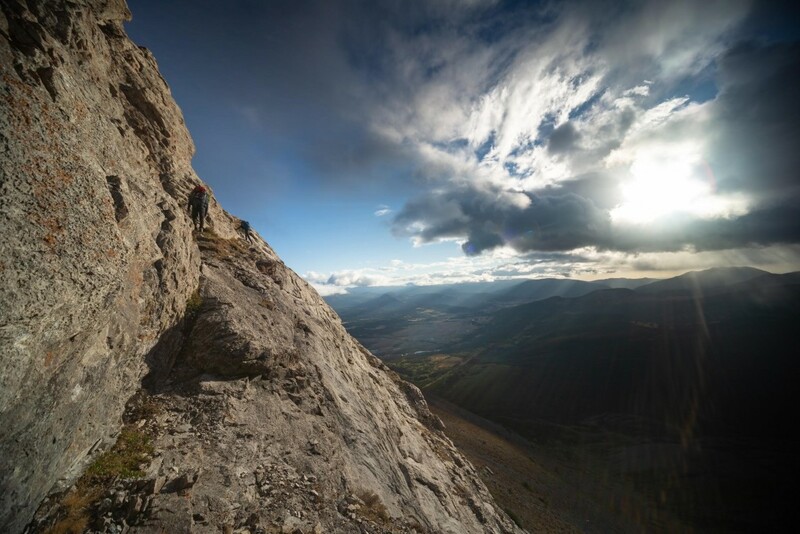 You will dislodge rocks during the first rappel which could prove catastrophic to a climbing party below. Anything knocked down will slide down the ice at an increasing rate of speed, until it reaches the bottom, with nothing to hide behind. Any party in the cave is completely exposed to rock or ice fall. Leave no trace. Caves are a very sensitive environment. Don’t leave V-thread cord or garbage in the cave. Do not damage the walls of the cave or any of the rock. And lastly, don’t poo in the cave, nobody wants to see that. You can put the belays in different spots than us and shorten or lengthen pitches at your discretion. 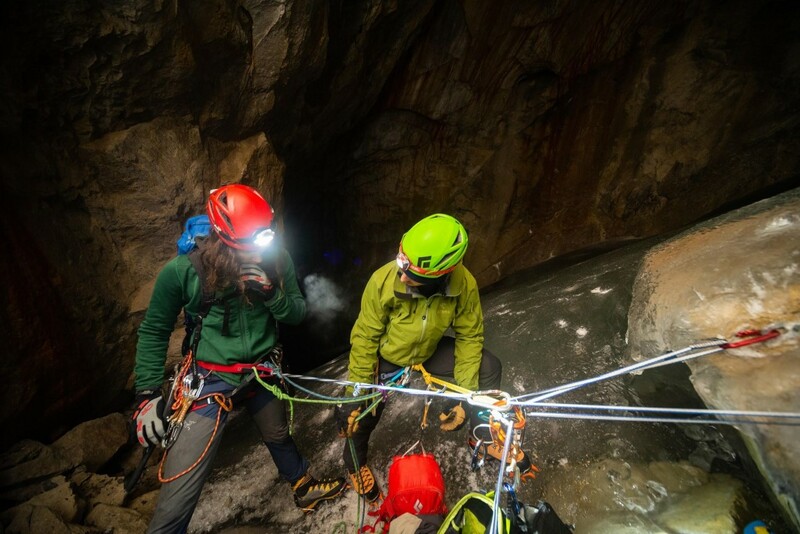 An extra headlamp, as well as extra batteries, are good things to carry into any cave. If you do end up visiting this area, try to limit the details you release to the public. You have probably realized that I didn’t mention anything about the cave's location or approach beta, this is because finding it is part of the adventure. Anybody who really wants to go here can find it with all the details available online.